A birthday celebration for J at Pesce in Russian Hill. He loves seafood and variety so the small plate style fit perfectly. We were immediately impressed with the warmth of the restaurant's decor and service, a nice long bar dominating the restaurant giving it a cozy neighborhood feel. We started with the Merluzzo Mantecato a grilled buckwheat polenta with cod brandade. 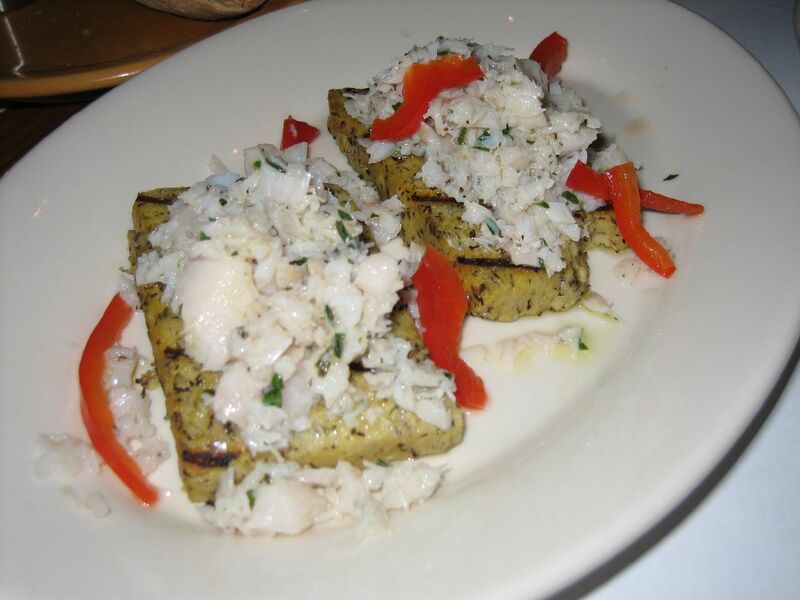 The flavor of the salt cod matched well with the grilled polenta and was devoured quickly. The texture of the polenta was stiffened by the grilling and use of buckwheat, but we wished there was less softness and more contrast in texture between the cod and the polenta. 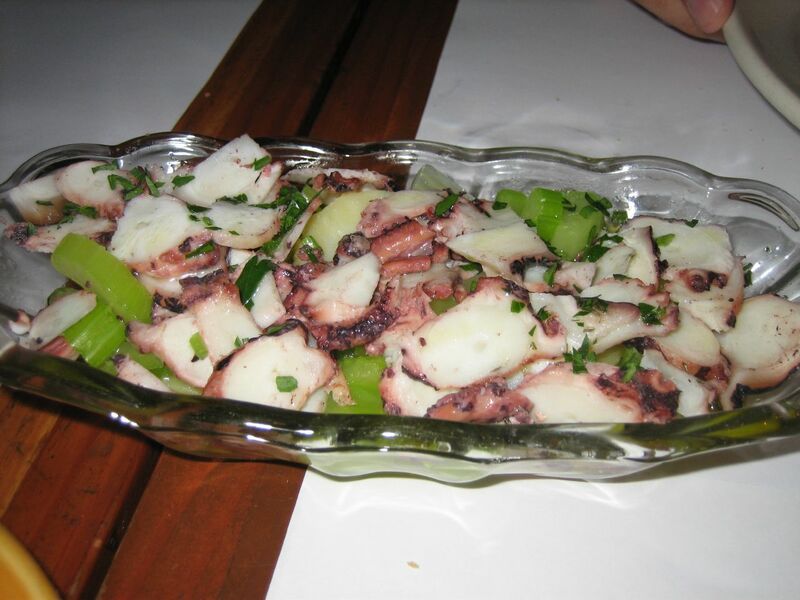 Next came the Polpo a warm octopus, potato and celery antipasta in a garlic vinaigrette. The braised octopus was full of a garlicky briney sea flavor which was also incorporated in the soft potato. The combination of the soft potato the braised octopus, the crunch of the celery and the savory sea flavor made this my favorite dish of the evening. The Roasted Whole Tai Snapper was fresh and came in a simple tomato based sauce allowing the fish to shine. The fish was filet and deboned at the table which made for a nice presentation. Though dish itself was upstaged by the juicy Merlot braised lamb shank. 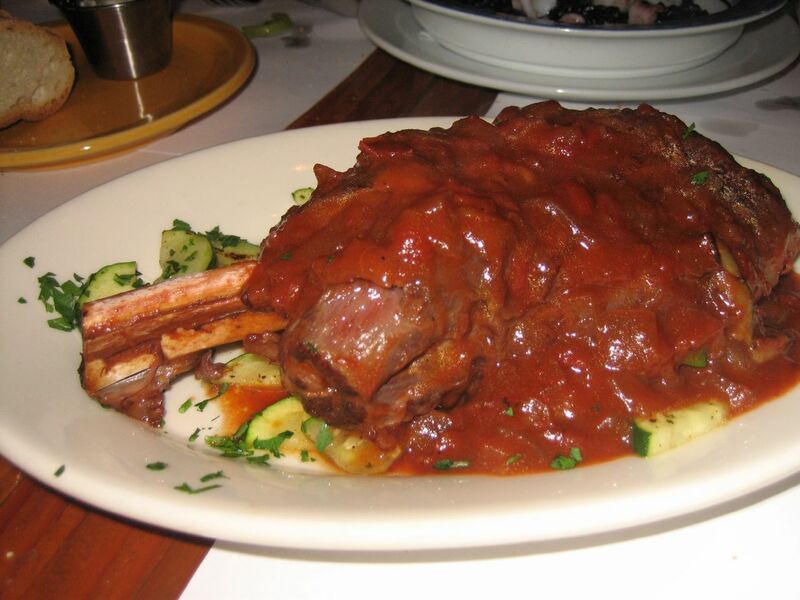 Our mouths watered as the dark red lamb fall off the bone with the first gentle touch of the fork. I thought the lamb was excellent, but would've like more spice to the sauce. J felt the simple sauce was a good foil to the rich render meat and was the highlight of the meal. Cioppino and squid ink risotto with grilled calamari were among the other items we sampled. I particularly liked the squid ink risotto which was thick and had a deep squid ink flavor. I understand that the restaurant is related to Antica Trattoria, which was one of my favorites when I lived in nearby. Happy to find that they've applied much of the same qualities to Pesce.